You don’t have to give up your favorite Oriental rug because it’s been damaged. At KIWI Services, we specialize in rug repair in Houston. 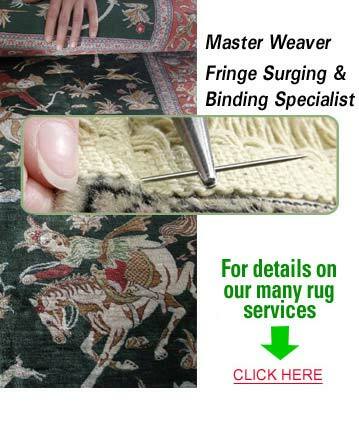 We only work with master weavers and weaving experts so that we can provide you with top-notch service while reviving and revitalizing your treasured rugs. There are thousands of different rug weaves, and our master weavers know the intricacies of each. We’ll never assign a rug to an inexperienced weaver or someone who doesn’t take pride in their work; in fact, we’ve built our reputation for 30 years by working only with the best professionals in the rug industry. With our 30 years of experience in handling rug repairs, you can trust your treasured rugs to KIWI. We guarantee our workmanship with a 1-year guarantee that our repairs will hold up to your daily life. Call us at 713-595-0425 and let us know what happened to your rug. Our expert rug repair technicians will be happy to evaluate and fix your rug using professional techniques that ensure it lasts for future generations.